Sony today announced the A6000, the successor to the NEX-6 and NEX-7, blending attributes of both and moving several key technologies forward. The big news is the change in the focusing system, which now uses 179 phase detect points on the imaging sensor that span a little over 90% of the frame. Sony is the latest to claim "world's fastest autofocus system"—I've seen that claim in four different press releases recently, from four different companies—with the footnote indicating that this is for interchangeable lens cameras with APS sensors. Technically, that means Sony is claiming that the A6000 focuses faster than their SLT DSLRs. Oops. 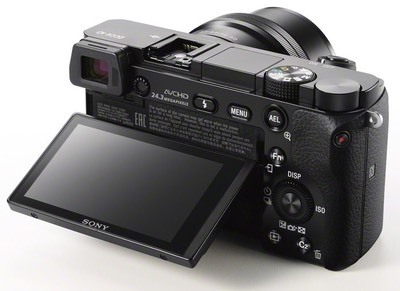 Overall, the new camera more resembles the NEX-6 than the NEX-7, as we no longer have the tri-dial controls. We do have the 24mp sensor of the NEX-7 updated inside, though. The price point is more NEX-6 (US$650 body) than NEX-7, as well. I'd say the A6000 is recognizably more NEX-6 than 7, and the new name seems to reflect that, too. We have the PlayMemories App support, WiFi with NFC, a 1.44m dot EVF downgrade from the NEX-6. BIONZ X joins the formerly NEX lineup, adding some of the JPEG improvements we've been seeing in a lot of the Sony models. Sony also seems to be standardizing on the new menu set we first saw in the RX1 and now has propagated through the RX line, the A7, and now the A#### models. On the video side we do get one new interesting twist: uncompressed 1080P on the HDMI port. Still, the big hoopla is going to be focus. At this price point, workable motion-following focus performance would be a bit of a breakthrough. If there's a disappointment in the Sony announcement, it's lenses. It seems that all of Sony's scattergun development is stretching their lens resources (and Zeiss's) thin. We got no new lens announcements with the A6000, nor a new roadmap for the E-mount. While there is a reasonably broad range of lenses available (and you can always use the FE-mount lenses that are starting to appear), I'd say there are still some very serious performance gaps. The 24mm, 35mm, and 50mm primes are fine, as are the 10-18mm and 16-70mm f/4 zooms. But the kit lenses aren't really up to the 24mp sensor and we've got plenty of missing good telephoto capability still. Note that Sony now says that they're doing things in the BIONZ X processor to process out diffraction impacts, but I'll bet this is basically a more carefully crafted sharpening approach. In other words, we're getting deeper and deeper into the realm of "the pixels you see (especially in JPEGs) aren't actually the pixels that were captured": they're instead heavily processed to "look good." That's not the same thing as having true resolution in the first place. Sony, please fill out the lens lineup with some additions that are worthy of the 24mp sensor (and update that 16mm! ).